"The British National Party...is therefore committed to stemming and reversing the tide of non-white immigration." If you are one of the many readers who contribute comments to articles on this blog, you will be aware that all comments are moderated and have to be approved before they are published. Virtually all of your contributions make it onto the blog. There are, mercifully, very few that I have to reject. On the rare occasion that I do have to reject a comment, it is usually on the grounds that it is libellous, completely irrelevant or because I decide that the people of Worcester Park wouldn't really be that interested in learning how to enlarge their male organs. Thankfully I have never had to reject any comments on the blog for being offensive, malicious, homophobic or racist. I like to think that says a lot about the tolerance of our local community. This Thursday sees the British National Party (BNP) field a candidate in the Nonsuch ward by-election. You may have seen them out campaigning in Central Road over the weekend, handing out leaflets which talk of the "bloodless genocide of the native British people"and the "johnny-come-latelies [who] arrive uninvited in our country" and "enjoy the hard-won fruits of our common history". So have you noticed how many shops in Worcester Park are owned and run by non-British nationals? I suspect, like myself until I began writing this article, that it has never occurred to you - because it simply doesn't matter. Yet I think it is worth remembering how many (as the BNP would call them) 'johnny-come-latelies' there are working hard, building local businesses and helping keep our community alive. BNP literature, of course, chooses not to mention such people as it rushes to tar all immigrants with the same nationalistic brush. Nor do they mention the indigenous work-shy underclass who shun work in favour of a life on benefits, leaving job vacancies that can only be filled by overseas labour. 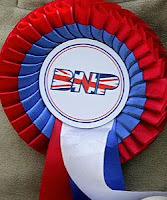 The BNP maintain they are not racist and that it is not a matter of colour. I simply invite you to read once again the excerpt from the BNP constitution at the top of this article and will leave it to you to decide. When the polling station opens on Thursday, I have every faith that the people of Worcester Park and North Cheam will send a resounding message to the BNP candidate, the only one of the four candidates who does not live in the local area. Am I sure that all reasonably-minded residents of Worcester Park will share my view that the most important thing in a society is that people contribute to the best of their ability, that they respect each other and their local area, that they obey laws and be good citizens and the only people we have to fear are those who choose not to do so - irrespective of their age, class, race or creed. As an interesting footnote, all of the other candidates have to some degree a 'non-British' background. But again that only matters insofar as it provides an interesting counterpoint to the BNP's argument. They are, all three, very capable candidates all of whom live in the immediate local area, all of whom contribute in the professional lives and their spare time to enrich the community we live in. Whether you agree with their particular policies or not, they are the kind of 'good citizens' that any community needs. So whether you ally yourself to Labour, Conservative or Liberal Democrat I simply hope that you turn out to vote on Thursday and will vote to preserve the harmonious and homogeneous local community that we all enjoy.